Fifth disease is also know as erythema infectiosum At one point in medicine, the classic childhood rashes were numbered. Measles was number one, scarlet fever was number two and so on. 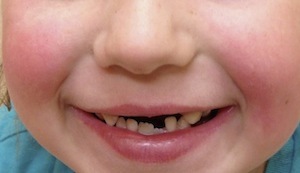 Only “fifth disease” has retained its numeric name. I think because “erythema infectiosum” is hard to remember. Typically, a child with fifth disease will have mild, vague “cold symptoms”. These symptoms may include fever (in 15 to 30%), headache or fatigue. Then after the symptoms have passed a rash develops. Usually, the bright, red, smooth rash begins on an individuals cheeks (see pictures). Erythema infectiosum’s preference for starting on the face has led it also being called “slapped cheek disease” . After beginning on the face, the rash moves to an individuals arms and legs. 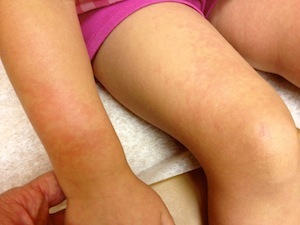 This rash is often described as “lacy” or “web-like”. The rash is triggered by heat can come and go for up to a month. Fifth disease is caused by parvovirus B19. This is not the same parvoviruses that affect dogs. Humans are the only source of parvovirus B19. The incubation period is usually 4 to 14 days, but can be up to 3 weeks. Fifth disease is spread through close contact with an infected individual - either respiratory (coughing) or touching. Importantly, fifth disease is diagnosis by it characteristic rash and individuals are no longer contagious once the rash appears. Fifth disease can adversely pregnancies. Fortunately, women who already had fifth disease are not at risk and about half of adults have had this parvovirus. A small percentage of pregnant women can lose their babies if they acquire fifth disease during the first half of pregnancy. Pregnant women who have been exposed to fifth disease should contact their physician. Behrman, Nelson's Textbook of Pediatrics, 16th edition, Philadephia, W.B. Saunders Company, 2000.